St. Patrick's Day comes once a year, and it gives many Aquarium animals an opportunity to bask in the limelight a bit. These are our most St. Patrick's Day animals, the greenest of the green, the perfect animals to get you in the mood for all the soda bread and green-tinged milkshakes. 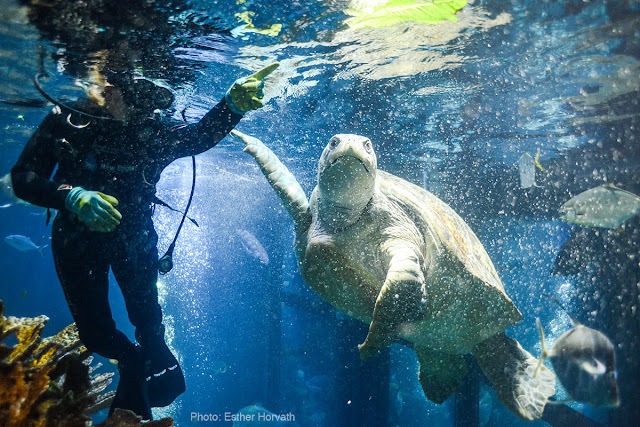 Seeing Myrtle the green sea turtle is a highlight of any visit to the Aquarium. And at 550 pounds, she's not hard to miss. Get more Myrtle on the Divers Blog. The divers are always careful when working with the moray eels, what with the eel's razor sharp teeth and all. Green morays may look menacing, but they are fairly docile animals. We offer them food every day (though some eels will not eat for weeks on end), and because of that we are quick to notice any odd behavior or physical issues. See how a moray eel—with all those teeth—gets a check-up at the Aquarium. 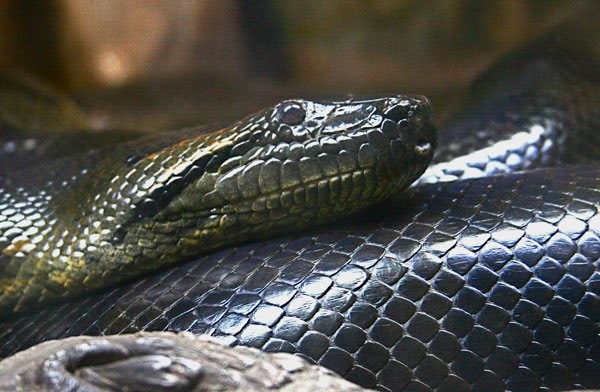 The adult green anacondas shed between five and eight times a year. Learn more about the process of shedding (think: sliding off a tube sock). 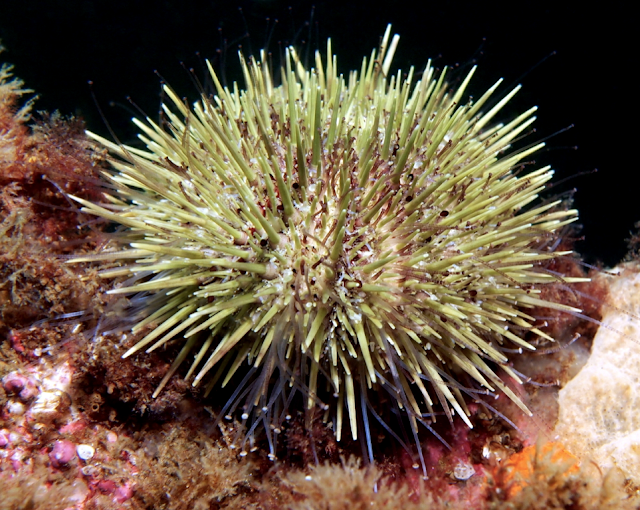 The sea urchin shell is made of calcium carbonate, and its spherical body is protected by hundreds of spines. Between the spines are tiny suction cups, or tube feet, which are used for locomotion. Learn some more interesting tidbits about this local species. Can you find even more green at the Aquarium? There is lots! Maybe you can spot a green ID band on the wing of a penguin. Look for penguins wearing a green bands! Or how about the bold green and black poison dart frog. How about the emerald color of the six line wrasse? Find us on social and tell us what Aquarium animals is helping you add green to your month. We're on Facebook, Twitter, Instagram, Tumblr, YouTube and Google+! Here at the Aquarium, it's easy being green. Come celebrate St. Patrick's Day with us at the New England Aquarium. Buy your tickets online and head inside to see the greenest of the green animals on our blue planet.